Happiness app for behavior management in schools. An app to track student behaviors for students to avoid suspensions and expulsions and an online community for educators to collaborate and communicate about ways to build/restore school culture. Students of color, especially ones from marginalized communities, have been suspended and expelled at higher rates than their peers. The Departments of Education and Justice have even made note of the demographic disproportionately associated with student discipline in public schools, and civil rights leaders and education reformers have associated this finding as a contributing factor to the school-to-prison pipeline. Currently, K12 institutions have a reputation for acting in extremes when it comes to responding to student behavior. They are known for either suspending/expelling students or adopting a laissez-faire approach. The institutions that suspend/expel are at risk of infringing on students’ civil rights, this is especially a sensitive matter considering the lack of diversity in education. On the other hand, the institutions that ignore student misbehavior are not providing the structure that is needed for students to fully conceptualize and internalize the reality that there are consequences for their actions, which is essential, especially for children in marginalized communities due to their lack of privilege. Both of these extremes create tension among educators and students/families, are void of the culturally-responsive approach needed for public schools, and rely heavily on the subjectivity of the disciplinarian. 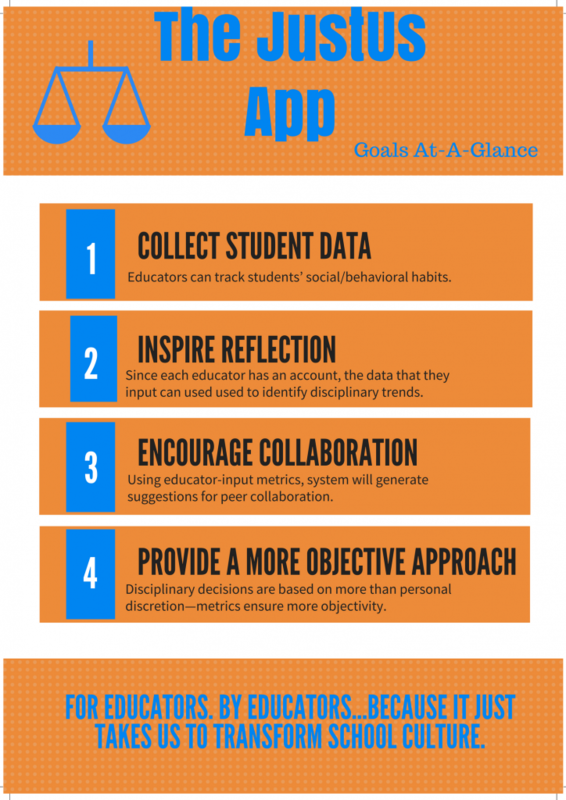 to addressing behaviors, suggest other educators to collaborate with based on strengths from the apps metrics, and use proximity and specialty to locate education consultants to help with school culture and discipline—all while providing documentation that educators are exhausting all avenues beyond suspension and expulsion. 1 of 924 Future project, Cosmo Inbox x Derrick Spencer <dds427@nyu.edu> 9:03 AM (0 minutes ago) to me Future project, Cosmo Quintin Haynes Arshy, sukoon, active wear company (elab) Gabe NYU Social Entrepreneurship Program Happiness app for behavior management in schools. An app to track student behaviors for high-risk students to avoid suspensions and expulsions and an online community for educators to collaborate and communicate about ways to build/restore school culture. Students of color, especially those in urban areas and charter schools, having been suspended and expelled at high rates than their peers. The Departments of Education and Justice have even made note of the demographic disproportionately associated with student discipline in public schools, and civil rights leaders and education reformers have associated this finding with the school-to-prison pipeline. Currently, K12 institutions have a reputation for acting in extremes when it comes to responding to student behavior. They are known for either suspending/expelling students or adopting a laissez-faire approach. The institutions that suspend/expel are at risk of infringing on students’ civil rights, this is especially a sensitive matter considering the lack of diversity in education. On the other hand, the institutions that ignore student misbehavior are not providing the structure that is needed for students to fully conceptualize and internalize the reality that there are consequences for their actions, which is essential, especially for children in marginalized communities due to their lack of privilege. Both of these extremes create tension among educators and students/families, are void of the culturally-responsive approach needed for public schools, and rely heavily on the subjectivity of the disciplinarian. The JustUs App is ideal for educators and K12 institutions because it allows educators to track student behaviors, gives recommendations to addressing behaviors, suggests other educators to collaborate with based on strengths from the apps metrics, and uses proximity and specialty to locate education consultants to help with school culture and discipline—all while providing documentation that educators are exhausting all avenues beyond suspension and expulsion. Since The JustUs App is a social venture, it relies mostly on social impact which can be measured by surveys via the app, suspension/expulsion statistics , and school-climate surveys.